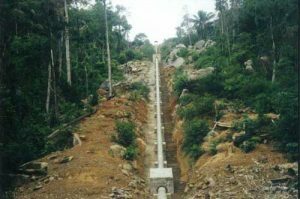 Approval has been granted for the construction of a 0.95-megawatt dual hydro-system at Moco Moco and a 2.2 megawatt at Kumu in Region Nine (Upper Takutu/Upper Essequibo. That was announced by Regional Chairman, Brian Allicock, at the recently concluded Regional Toshaos’ Conference in Lethem, reported government’s Department of Public Information. The projects will be financed from funds received through the United Arab Emirates and the Guyana REDD+ Investment Fund (GRIF) under the Low Carbon Development Strategy (LCDS). The project is estimated to be concluded in two and a half years. On June 08, Minister of Public Infrastructure, David Patterson announced that several renewable energy projects involving solar, wind and hydro and amounting to some 30 megawatts will be completed by 2020. These are to be constructed in the three new townships of Bartica, Lethem and Mabaruma, as well as Mahdia and several interior locations. Back in 1999, the Chinese funded 500 kilowatt Moco-Moco Hydro power station went into operation. However, a landslide in 2003 caused severe damage to the facility and it was turned off. Part of the Moco-Moco Hydro-power station. In addition to the Moco Moco and Kumu hydro projects, funding has been secured to commence the hydro project in Kato, Potaro-Siparuni (Region Eight). The government has given private developers until the end of July to secure financing for the US$4.4Million 2.2-megawatt Tumatumari Hydro Project. Once a company is successful in securing the funds the government will enter in a power purchase agreement that company. However, failing this, the government will assume control of the project. In addition, a micro-hydro of 0.02-megawatt also catered for in the National Budget at a cost of US$200,000 will commence in Mabaruma during the third quarter of this year. Completion is anticipated for mid-2019. The Private Sector Commission recently criticised government’s emphasis on solar energy and small hydro-power stations, saying those would not provide cheap electricity for industrialisation. 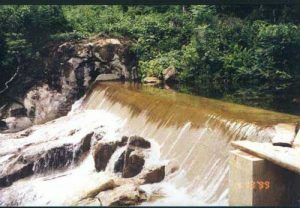 Instead, the business organisation reiterated its call for government to construct large scale hydro-power stations such as those that have been long proposed for Amaila Falls, Tumatumari, Turtuba and Mazaruni.